Jun Sung Hong received his Ph.D. in Social Work at the University of Illinois, Urbana-Champaign and joined Wayne State University School of Social Work as an Assistant Professor (tenure-track) in 2013. He has also been an Adjunct Assistant Professor at Sungkyunkwan University (summer) in Seoul, South Korea since 2015. 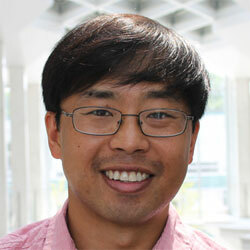 For the past several years, Dr. Hong has primarily conducted research on factors associated with bias-based bullying and peer victimization of racial/ethnic minority, immigrant, LGBTQ, juvenile justice involved and impoverished adolescents and young adults in the U.S. and in South Korea. He has also collaborated with scholars in South Korea, Taiwan, Sweden, Scotland, Switzerland, and Brazil on research projects. In 2017, he was a keynote speaker in Sweden and Taiwan. His research has been published in major peer-reviewed journals, such as the Journal of Criminal Justice; Journal of Youth & Adolescence; Journal of Immigrant & Minority Health; Journal of Interpersonal Violence, Psychology of Violence; Child & Youth Care Forum; American Journal of Orthopsychiatry; Violence & Victims; Trauma, Violence & Abuse; Child Abuse & Neglect; and Youth & Society. In addition, he has been a guest editor for the Journal of Child & Family Studies, American Journal of Orthopsychiatry, and Scandinavian Journal of Psychology. He is currently serving on the editorial board for the Journal of Youth & Adolescence, Psychology of Violence, Journal of Family Violence, and Journal of Child & Family Studies. He is currently co-authoring a book entitled, School Bullying, Diversity, and Disparities: Investigating Youth Vulnerability, Marginalization, and Victimization. He has also conducted interviews with several news media and consulted with school districts on bullying and school violence. Most recently, his research was cited by NBC News. He was a past Fulbright recipient, and more recently, he received the Alberti Center Early Career Award and the Wayne State University Academy of Scholars Junior Faculty Award. Hong is exploring direct and indirect effects of peer victimization on sexual risks among urban African American adolescents.